The horizontal monobloc MHP-600P is designed for spesific plate and profile production from the circular wire. Nevertheless, it is also possible to draw the wire replacing the inlet head to die carriage. According to the client need the one or two steps drawing is selected. Equipped with three rollers decalated in 120º to separate the coil turns of the specific profiles. 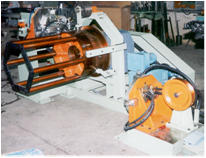 The material can be collected directly over the coil (by the rods) or be transported to a cutting straightener or spooler. The wire (die carriage), triangular perfile (head of three rollers) or square and rectangular (head of four rollers).